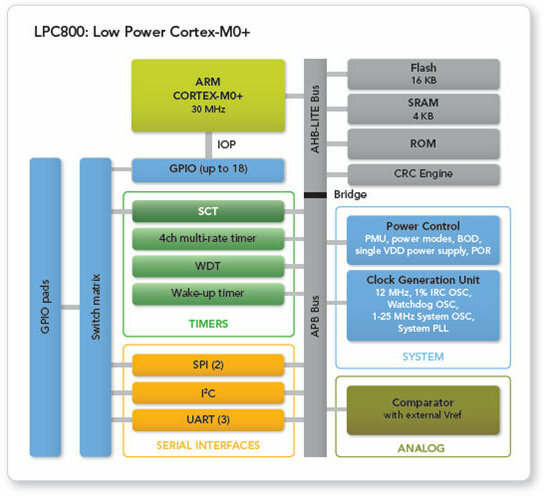 Following ARM Cortex M0+ announcement in March 2012, NXP Semiconductors has just announced the LPC800, tiny 32-bit MCUs based on Cortex M0+ core @ 30 MHz designed to replace 8-bit MCUs, together with LPCXpresso development board for the LPC800. The MCUs come with 1 to 4KB SRAM, 4 to 16 KB Flash, several serial interfaces and are available in SO20, TSSOP20, TSSOP16 and even DIP8 packages. 10 kHz low-power oscillator for the WKT. PLL allows max CPU rate without a high-frequency crystal. NXP has re-designed serial peripherals in order to be as power efficiency as possible. For example, the new SPI interface can operate at frequencies independent of the processor clock, avoiding the need to over-sample 4-to-n times the SPI just to receive data. I2C has also been modified to allow the MCU core to operate at at near-zero power consumption (even without a system clock) and wake up upon an (I2C) address match. 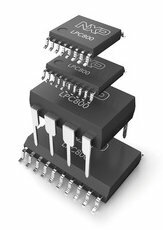 The LPC800 provides driver-free operations, and drivers for I2C and UART do not take up Flash space anymore, and those interfaces can simply be controlled via API calls. The same is true for power management. There are 6 LCP800 micro-controllers in the family. For evaluation and early development, NXP provides the LPC812-LPCXpresso demo board (OM13053) featuring the top of the range LPC812 MCU with 4 kB SRAM, 16 kB Flash and lots of peripherals and GPIOs (The last MCU in the table above), 3 LEDs and a potentiometer. It is connected to the LPCLINK board that allows programming and debugging via USB. You can watch the video below for an introduction to the demo board, and development tools. Programming can be done with LPCXpresso, a free Eclipse-based IDE, ARM Keil Microcontroller Development Kit or IAR Embedded Workbench. Support, free tools, and sample code are available from the LPC developer community. LPC810 price starts at $0.39 USD (supposedly for DIP8 package and a massive order) and LPC800 evaluation kit can be pre-ordered for $15 from Mouser Electronics with final product availability starting in February 2013. Further information is available on NXP LPC 800 page, LPC8120LPCXpresso demo board page and a surprisingly informative and well formatted press release.